Last week I had a sweeping intervention of good luck and was both relieved and joyous about my good karma. This week the universe is taking it all back with a vengance. Almost every task I’ve gone to do this week has proven more difficult than reasonable and often doomed to failure. I won’t bother you with all my disasters, but leave you with a few highlights mostly to account for the scarcity of my posts this week. I bought some beautiful broccolini (aka asparation) which was going to make a lovely post, then I totally overcooked it. It’s pretty rare that I overcook something beyond any point of edibility, but sure did this time. I took my children to a birthday lunch for my daughter at an actual restaurant and probably gave myself high blood pressure from the immensity of bad behavior in public. I swear to remember that children are not fit for restaurants, at least not *my* children. Then to top it all off, I left the house to do some work on this blog, only to be totally thwarted by a call to return home, at which point, my stupid now to-go coffee literally leapt out of the cup holder spilling coffee all over the car and my laptop which had only seen five words typed during it’s excursion out of the home. In fact the trend continues, while typing that last sentence, my son managed to pull an entire bucket of diluted Murphy’s Oil Soap off the kitchen counter and all over the floor. Luckily I’m no stranger to liquids and laptops. I think on my last one I replaced no less than five keyboards due to spills. In general, I am just a total and complete klutz. If there’s an accidental damage policy, I absolutely have to buy it because without a doubt, I will trip, fall down, drop, kick, burn, or let the preschoolers to close to anything remotely breakable. So fear not Internet, my accidental damage policy is in place and I will get this fixed. But even being without my computer for 30 minutes feels like I lost an appendage. We have another saying in my house that you know it’s going to be a good meal if I burn myself while cooking. That’s just like a tiny testament to my inescapable clumsiness. I can’t actually recall if I burned myself while making this comfort sandwich, but I think destroying a laptop when trying to write it up should count for something. Melted cheese is always a comfort to me, and I’d make another sandwich right now if I hadn’t run out of ciabatta. Slice your ciabatta in half lengthwise, then into 2-3 inch sections for sandwiches. Brush the top and the bottom of the bread with olive oil. 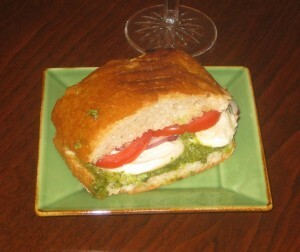 Generously smear the bottom half of the ciabatta with pesto, top with 2 slices mozzarella per sandwich, then tomatoes, then red onion. Sprinkle with salt and place top of ciabatta. Grill sandwich in a grill pan over medium low heat. Grill on bottom until you see mozzarella begin to melt, then use tongs to flip sandwich and grill the top. Remove when cheese begins to melt from other side. Delicious! I don’t have a grill pan so I broiled in the oven instead. Yum! Thanks Emily! I’m so glad y’all like it!